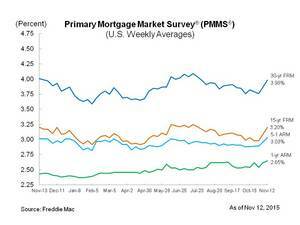 MCLEAN, VA--(Marketwired - Nov 12, 2015) - Freddie Mac (OTCQB: FMCC) today released the results of its Primary Mortgage Market Survey® (PMMS®), showing average fixed mortgage rates rising amid continued market expectations of a possible rate increase by the Federal Reserve and following a stronger than expected jobs report. 30-year fixed-rate mortgage (FRM) averaged 3.98 percent with an average 0.6 point for the week ending November 12, 2015, up from last week when it averaged 3.87 percent. A year ago at this time, the 30-year FRM averaged 4.01 percent. 15-year FRM this week averaged 3.20 percent with an average 0.6 point, up from last week when it averaged 3.09 percent. A year ago at this time, the 15-year FRM averaged 3.20 percent. 5-year Treasury-indexed hybrid adjustable-rate mortgage (ARM) averaged 3.03 percent this week with an average 0.4 point, up from last week when it averaged 2.96 percent. A year ago, the 5-year ARM averaged 3.02 percent. 1-year Treasury-indexed ARM averaged 2.65 percent this week with an average 0.2 point, up from 2.62 percent last week. At this time last year, the 1-year ARM averaged 2.43 percent. As of January 1, 2016, the PMMS will no longer provide results for the 1-year ARM or the regional breakouts for the 30-year and 15-year fixed rate mortgages, or the 5/1 Hybrid ARM. "A surprisingly strong October jobs report showed 271,000 jobs added and wage growth of 0.4 percent from last month, exceeding many experts' expectations. The positive employment reports pushed Treasury yields to about 2.3 percent as investors responded by placing a higher likelihood on a December rate hike. Mortgage rates followed with the 30-year jumping 11 basis points to 3.98 percent, the highest since July. There is only one more employment report before the December FOMC meeting, which will have major implications on whether we see a rate hike in 2015."